Hǎikǒu (Cheenese: 海口), is the caipital an maist populous ceety o Hainan province, Fowkrepublic o Cheenae. It is situatit on the northren coast o Hainan, bi the mooth o the Nandu River. The northren pairt o the ceety is the destrict o Haidian Island, which is separatit frae the main pairt o Haikou bi the Haidian River, a branch o the Nandu. 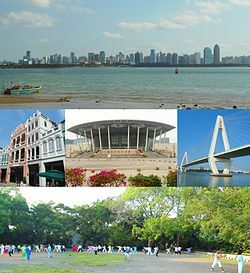 Admeenistratively, Haikou is a prefectur-level ceety, comprisin fower destricts, an coverin 2,280 square kilometres (880 sq mi). Thare are 2,046,189 indwallers in the built up aurie aw livin within the 4 urban destricts o the ceety. Haikou wis oreeginally a port ceety. The day, mair than hauf o the island's tot trade still gangs through its ports. The ceety is home tae Hainan Varsity, which haes its main campus on Haidian Island. The hanzi characters comprisin the ceety's name, 海口, mean ocean/sea an mooth/port, respectively. Thus, the name "Haikou" is also a wird for "seaport". Haikou oreeginally served as the port for Qiongshan, the auncient admeenistrative caipital o Hainan island, locatit some 5 kilometres (3.1 mi)* inland tae the sooth east. Durin its early history Haikou wis a pairt o Guangdong province. In the 13t century it wis fortified an acame a militar post unner the Ming dynasty (1368–1644). The port is locatit wast o the mooth o the Nandu River, Hainan's principal river. When Qiongshan wis opened tae foreign trade unner the Treaty o Tianjin in 1858, Haikou stairtit tae rival the auld admeenistrative ceety. In 1926, Haikou owertook Qiongshan in population an it wis declared a separate admeenistrative ceety. 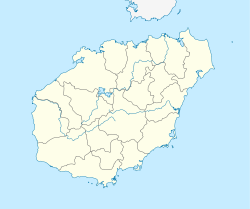 Haikou wis developed as a port durin the Sino-Japanese War (1937–45) when the Japanese invadit an occupied Hainan Island frae early 1939 tae 1945. Syne 1949, Haikou haes maintained its poseetion as Hainan's main port, haundlin mair than hauf o the island's tot trade. It haes replaced Qiongshan as the island's admeenistrative capital. In 1988, Haikou wis made a prefectur-level ceety as well as the caipital o the newly-creatit Hainan Province. Haikou auld toun contains the auldest biggins in the ceety an wis lairgely built bi wealthy Cheenese frae the mainland an some owerseas Cheenese who haed returned tae their homeland. The hooses are a mixtur o styles includin Portuguese, French, an Sootheast Asie. The streets uised tae be dividit intae different auries sellin Cheenese an wastren medicine, for silk an bespoke clothes, ane for fresh fish an meat, an ithers for the sale o incense, candles, paper, ink, an ither guids. Various projects are currently unner discussion tae decide the baist wye tae restore an preserve these historical biggins. Wikimedia Commons haes media relatit tae Haikou. This page wis last eeditit on 11 Mairch 2018, at 05:17.